PORTLAND, Maine — A strain of a drug-resistant skin disease that has afflicted sports teams, prisons, and military units is proving a persistent pest among lobstermen and their families on a Maine island. In the past two summers, more than 30 people on Vinalhaven Island have come down with painful and persistent skin infections that required repeated treatments with intravenous antibiotics for some of the victims, but medical authorities say there is no indication the germ is linked to lobsters. Boiling or steaming the lobsters would kill any bacteria that infected fishermen who handle them might leave behind, said Dr. Stephen Sears, Maine state epidemiologist. 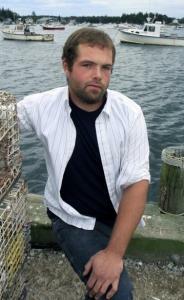 The working theory is that methicillin-resistant staphylococcus aureus, also known as MRSA, moves easily among lobstermen because their work — hauling traps, cutting bait, handling lobsters — causes plenty of scraped knuckles, pinched fingers, and small cuts and nicks, giving the infection a foothold, Sears said. No deaths have been associated with the outbreak, but lobstermen and others have sought treatment at the island medical center. Some have been treated several times. Landon Morton, a lobster fisherman, has battled staph infections four or five times in the 18 months since first coming down with MRSA while working on one of the town’s docks. Just a few weeks ago, he began his latest bout, and his 18-month-old daughter has it, too. Morton said there’s no mistaking it for a run-of-the-mill skin rash, because it is painful. Hospitals have been dealing with infections caused by the “superbug’’ for 30 years, said Nicole Coffin of the Centers for Disease Control and Prevention in Atlanta. Community-acquired MRSA, the strain that is making the rounds in Vinalhaven, tends just to cause skin lesions, Coffin said. Left untreated, however, they can become deadly. Previous instances of community-acquired MRSA have involved prisons, military recruits, and sports teams, Coffin said. Perhaps the best-known case involved the St. Louis Rams in 2003, when the CDC was called in to investigate a cluster caused by skin abrasions and locker room contamination. MRSA is carried on human skin and can be transferred to others through towels, gloves, or other shared items. But it is a bit of a medical mystery how MRSA arrived on the 1,200-resident island in Penobscot Bay. Pinning down the culprit seems unlikely. MRSA is not carried by seafood, so that rules out herring bait and the lobsters, Sears said. And while MRSA has been documented in sea water and on beaches, it does not survive in those environments in concentrations necessary to cause human infection, he said. To cut down on MRSA infections, people dealing with the infections on Vinalhaven are following guidelines recommended by the CDC: frequent hand washing, use of disinfectants, washing clothes in hot water, and setting the dryer on hot. These days Morton takes multiple showers daily, washes his hands frequently, and changes clothes several times a day.